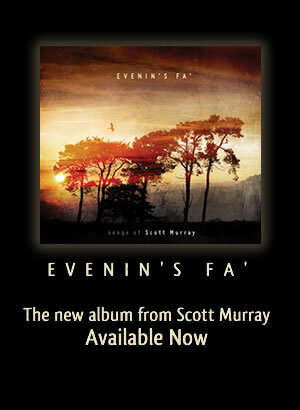 Scott Murray, New Album - Evenin's Fa, available now. I'm a lowland Scot, brought up in Dunbar and Edinburgh. Music has always been an important part of my life – school choir, church choir (I'm sure the harmonies I hear and sing still come from that background). In the mid sixties when studying at Edinburgh College of Art I sang with a group, the Seventh Sons, at the Gamp, the Place, the International Club – we liked R&B, blues, jazzy stuff. “…incredible…an emotion-filled performance that raised the hair on my head and led to a well-deserved standing ovation”. I've always written songs (40 years ago I would make up tunes for poems by Louis MacNeice, Robert Frost, Emily Dickinson) and I would play them to myself on the guitar I paid 10 shillings for when I was still at college. 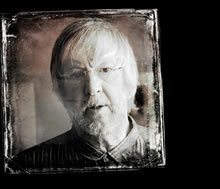 I got much more confidence about songwriting through a New Makars Trust project in Fife. I worked with older folk in Ladywalk House in Anstruther and from their reminiscences came two songs, 'Guiding Light, Evening Star' and 'A Dyker's Compliments' both of which are on the aforementioned 'Sharp & Sweet.' Both get played on the radio occasionally (cheers Robbie! ), and folk club audiences join in with and even request them, a source of great pleasure to me. I have worked for the last 15 years on and off as a music tutor, mostly for the Scots Music Group in Edinburgh, with community singing groups as well as smaller classes. I think one of my main strengths as a tutor is giving folk confidence, and I'm very proud that some folk I've worked with have gone on to be respected performers themselves. In 2010 – 2011 I worked on a Scots Music Group Creative Scotland Inspire Project, one of the highlights of my working life so far. I was lucky enough to land up working with the Bethany Trust/YMCA men's drop in in Leith. Gica Loening and I worked with a group of homeless/vulnerable men, and telling the stories of the men through songwriting became an important part of our work. Two songs on Evenin's Fa' come from the project - 'I Thought I Had No Voice' and 'We'll Follow the Music.' The men are an ongoing source of inspiration. We sang a little set of our songs at a Radical Voices gig in Leith, and Roy Bailey asked me to send him 'I Thought I Had No Voice' – I have an email from him saying he's learning the song, will perform it, and may even record it, with my permission, should he make another CD. Permission granted.